When planning a party, rule number one is to always prepare for the inevitable….the curve ball that rocks your world and makes your head spin. Last December, I was asked at the last minute to host a Christmas dinner for 50 women from church in our home. A few furniture adjustments and 9 tables later, we were almost ready….until I heard the sound of gushing water. The hot water heater had burst and my garage was full of water. I frantically grabbed a broom, shut off the water, and called in the plumber. If you’ve ever dealt with the “no water scenario”, you realize how much you use it – all. of. the. time. There’s no toilet, no washing your hands, and forget about washing the dishes….those are getting housed in a laundry bin hidden in your pantry. Oh and plan on mopping your floors with water bottles! The guests started to arrive, at the same time the plumber was parked in the driveway and just as were were sending ladies holding pitchers to our neighbors to borrow water. It made for some good laughs and a night that I won’t soon forget. Since this was a last minute shindig, I had to throw together some table decorations without spending a dime. Since I was dealing with #watergate at home, some creativity had to come into play as time wasn’t on my side. I picked some Seville oranges from a tree, grabbed Epsom salts from my bath for snow, fresh cranberries, pine cones that smelled of cinnamon, some green and red decor balls, and leaves from the tree and went to work. 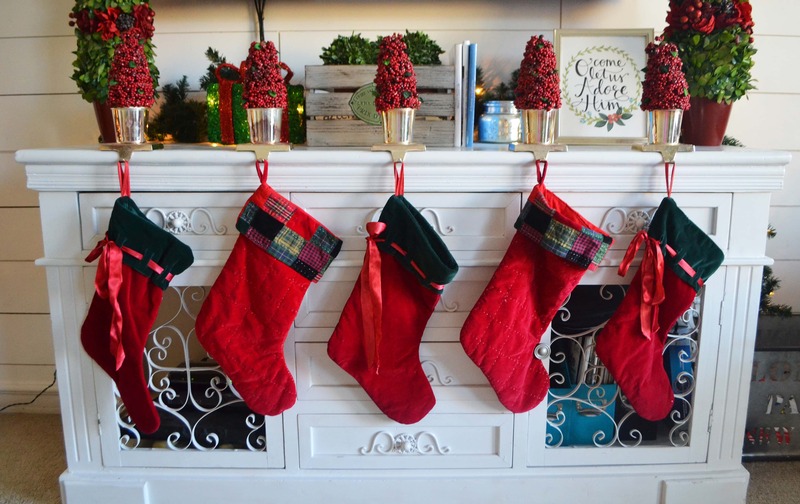 If you are anything like me, you’ve browsed those designer stores and have seen those beautiful holiday centerpieces only to experience severe sticker shock but here are ways to make show stopping decor without breaking the bank. I’ll share my secrets to making quick centerpieces and tablescapes by using what you may already have in your home and even in your backyard. 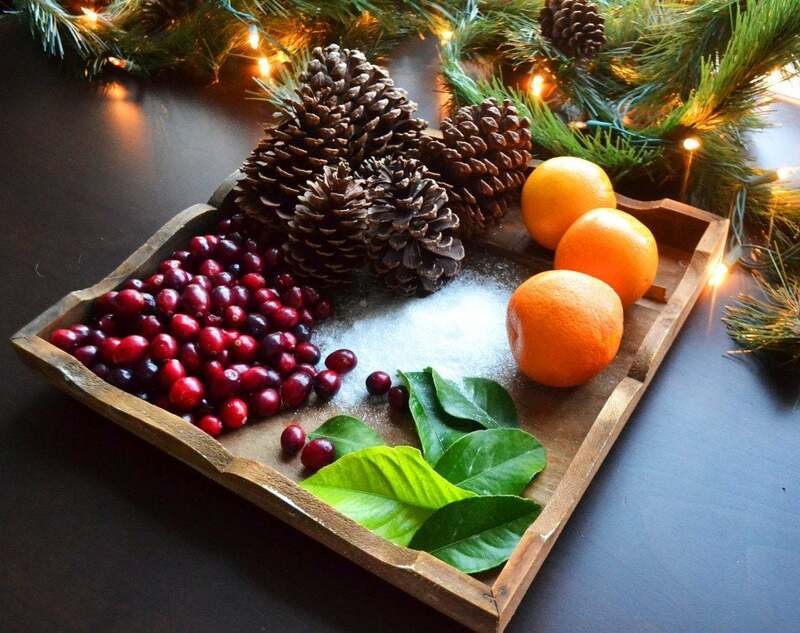 Using natural elements is a great way to keep your holiday decor up all winter long. 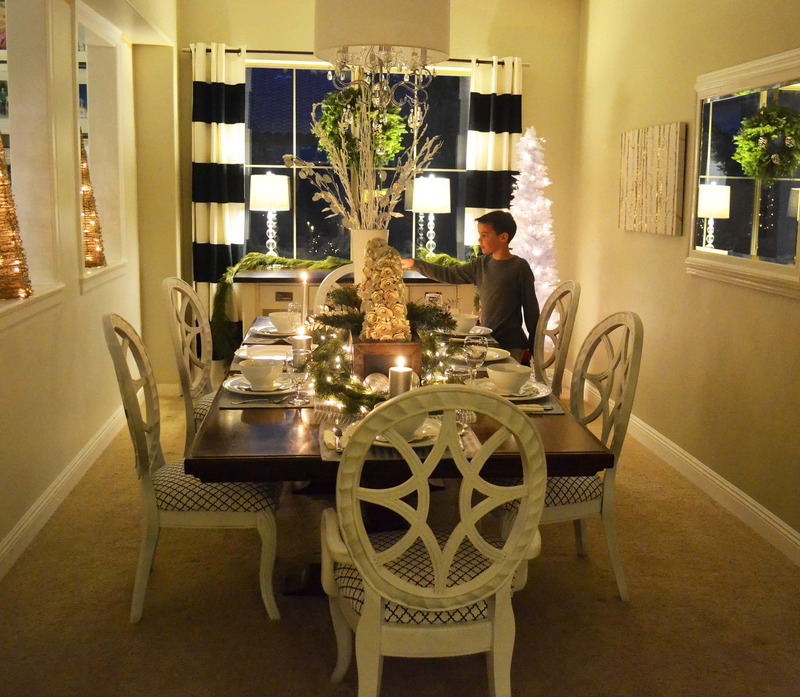 My dining room is the focal point of my home as it’s what you see as you walk through my door. I use fresh white, wintergreen, dark wood and silver accents to make it feel like a magical Winter Wonderland. 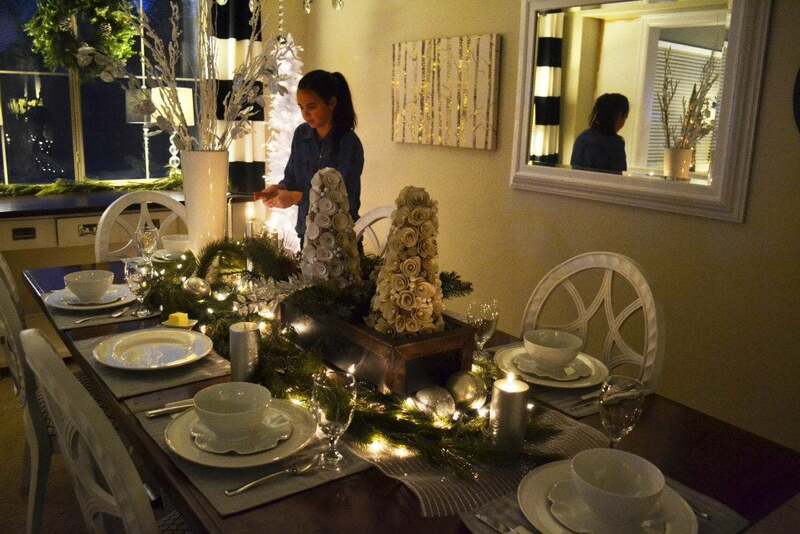 This tablescape is decorated simply with pine wreaths, garland, Christmas lights, white dishes, and silver ornaments. Most of the silver ornaments are ones that can no longer hang on my tree because the tops have broken off so I reuse them by placing them in bowls for shiny accents. You can use fresh garland (great deal at Sam’s Club) or buy it at Michael’s (only $2-3 when it’s on sale) and wrap Christmas lights all throughout it. When you place silver or gold ornaments in the garland, the lights make them glisten. 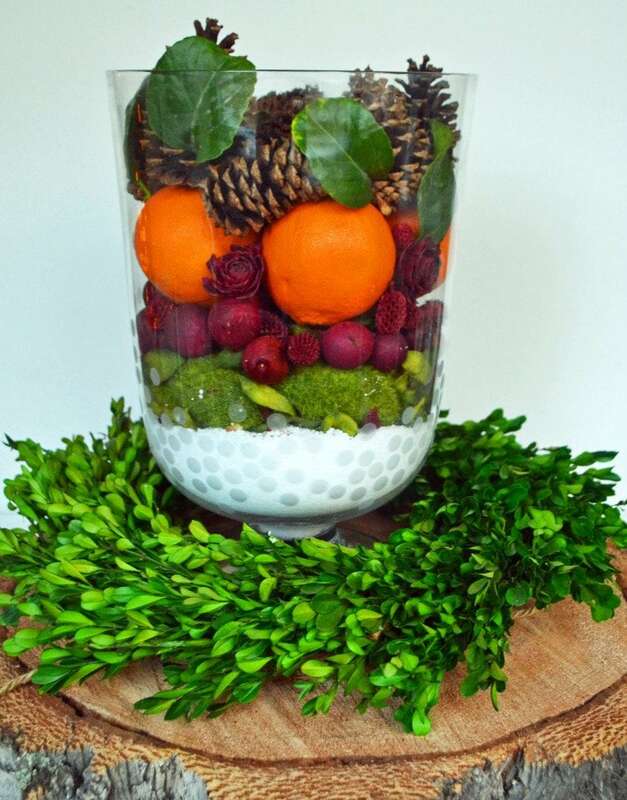 To make this centerpiece, you layer Epsom salt for the snow, some type of greenery, fresh cranberries or red balls (from craft stores, Target, or Home Goods), fresh oranges, pine cones, and freshly picked green leaves. The glass hurricane is from IKEA but you can use any type of glass holder for a centerpiece. I used a boxwood wreath that I usually have on my front door for the base and set it on top of a piece of real cut wood. It’s simple, elegant, and rustic all wrapped into one. 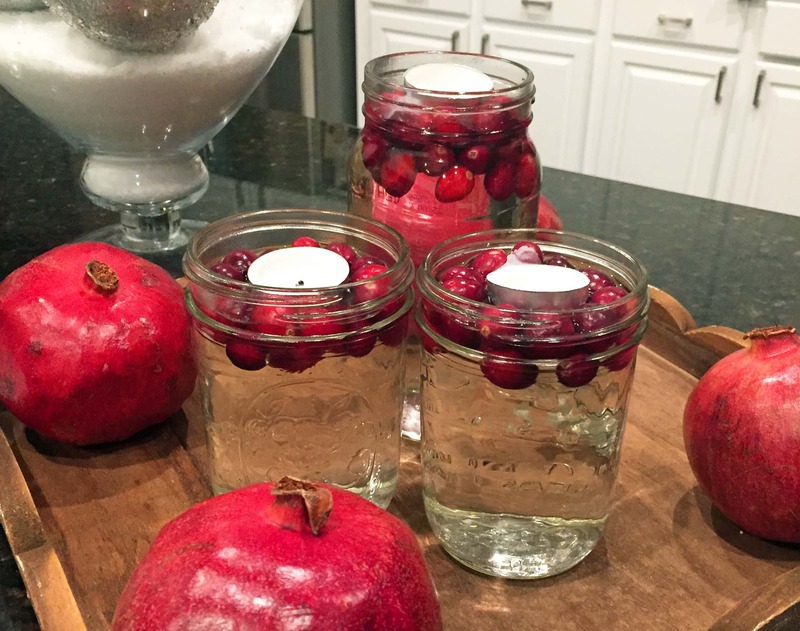 One of the most simple centerpieces is to use mason jars, water, fresh cranberries, and a votive candle. Put it on some wood and add some pomegranates and you have a beautiful display. The light plays perfectly on the water and adds so much festive charm to any table. 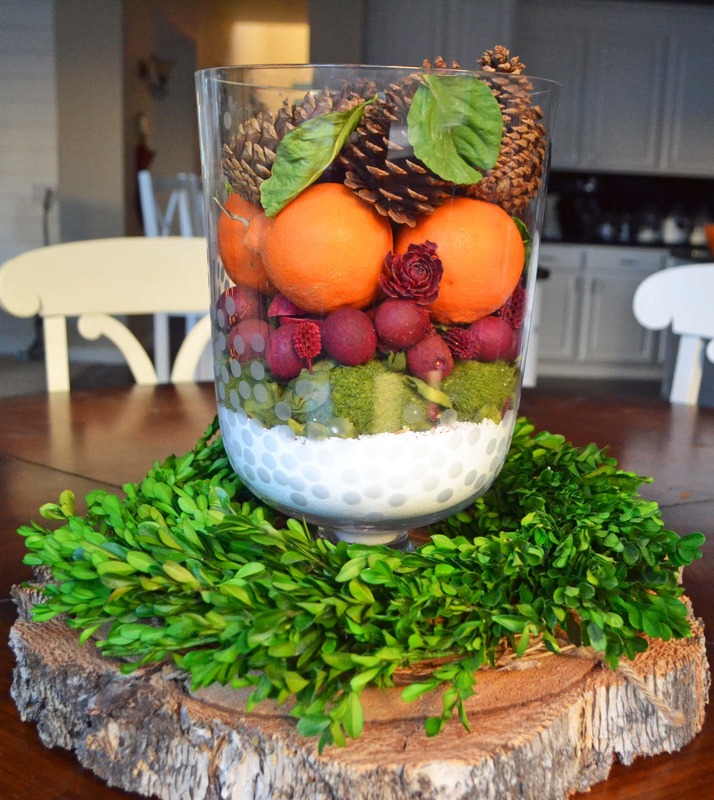 Let those creative juices flow and make your own natural centerpiece. Tag me at #modernhoney so I can see your beautiful and whimsical creations that didn’t break the bank. Merry Christmas!